I opine that pallet wood recycling has entered a new level, which I name as pallet wood extravaganza. This is because we have recycled each and every furniture item for the house, for the restaurants and some other commercial places. 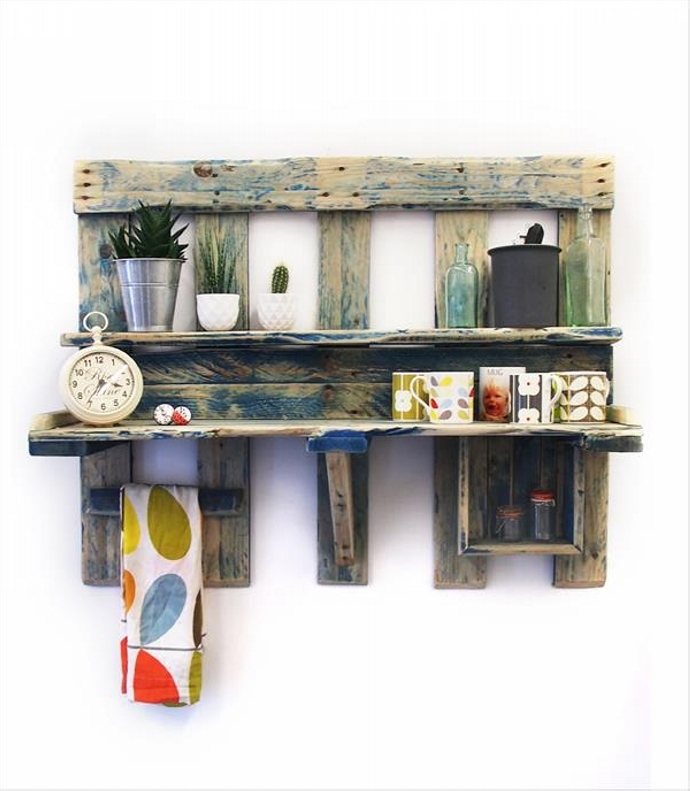 We have used the pallets in garden décor ideas, in wall art ideas, from wooden flooring to pallet deck. 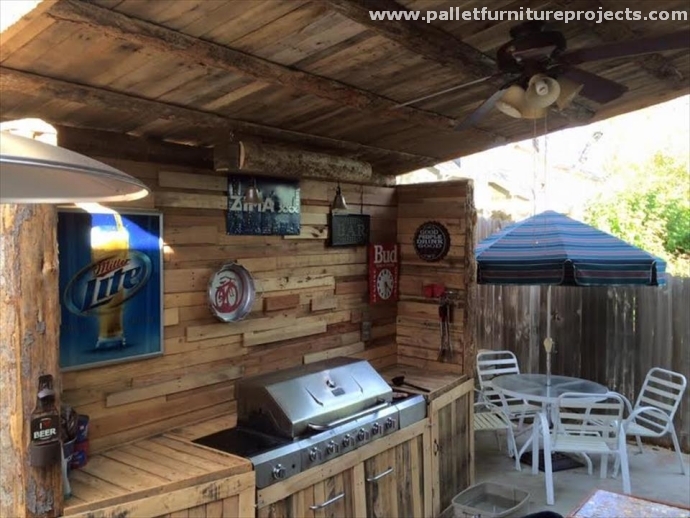 And the good thing is that the pallets have never disappointed us. They have always been upto the mark. This time we are doing something exclusive especially for ladies. 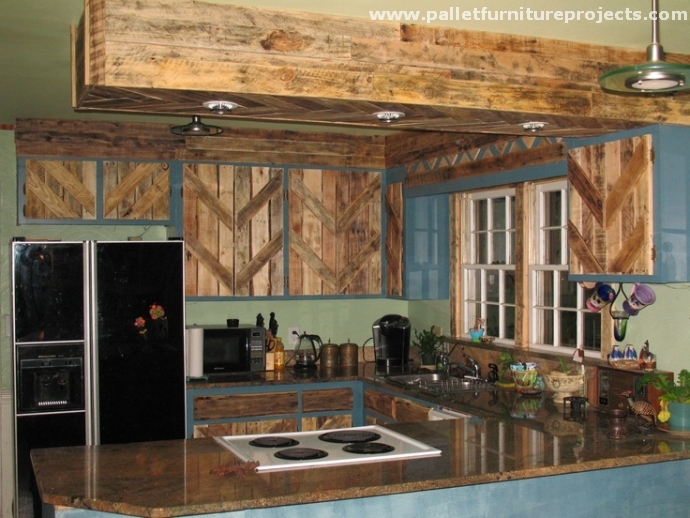 We are going to introduce some great pallet wood kitchen installations. 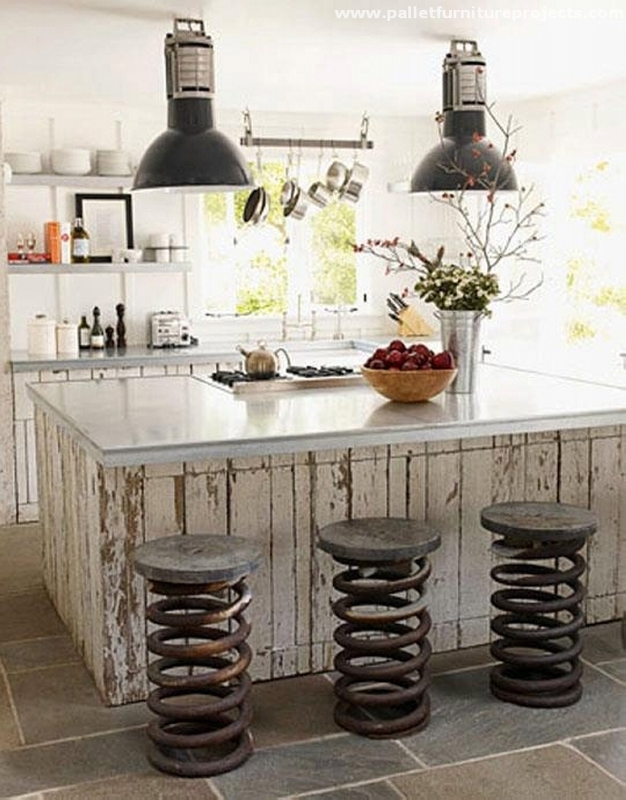 A kitchen can not be complete unless it is equipped with some decent kitchen cabinets or proper wooden cupboards. Because while working in kitchen you have to deal with a number of accessories and then you have to place them back on some specified place. 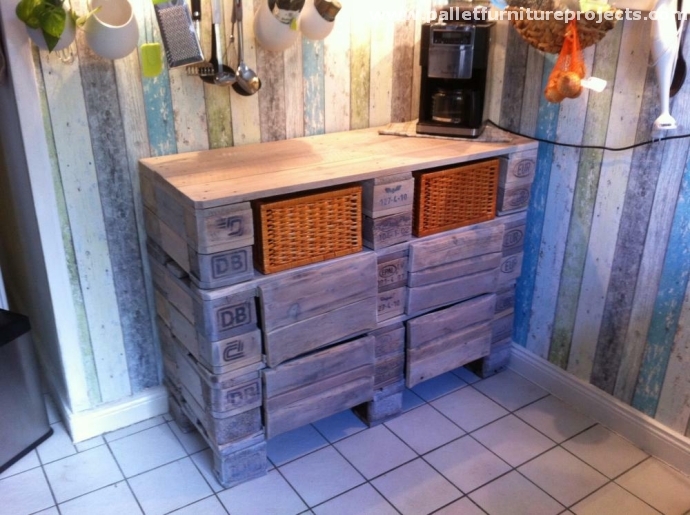 So this pallet wood recycled cupboard would be a great support in the kitchen for house wives. 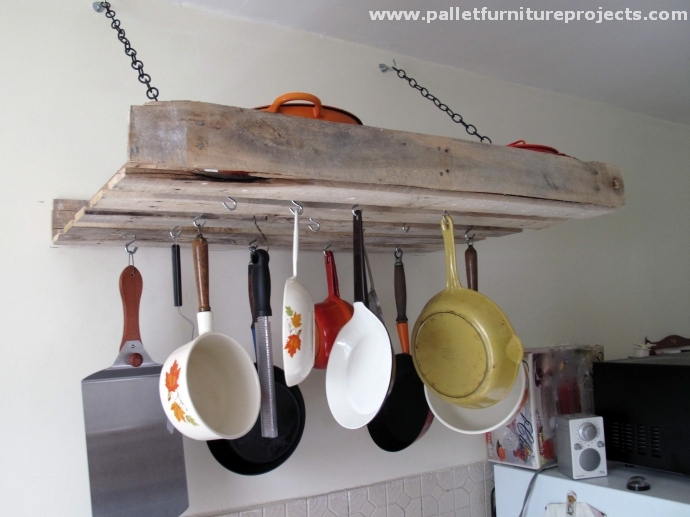 This pallet wood recycled kitchen hanging shelf is for the time when your kitchen cabinets are stuffed with accessories, and you are still looking for some additional support where you can hang such accessories like sauce pan, frying pan etc etc. 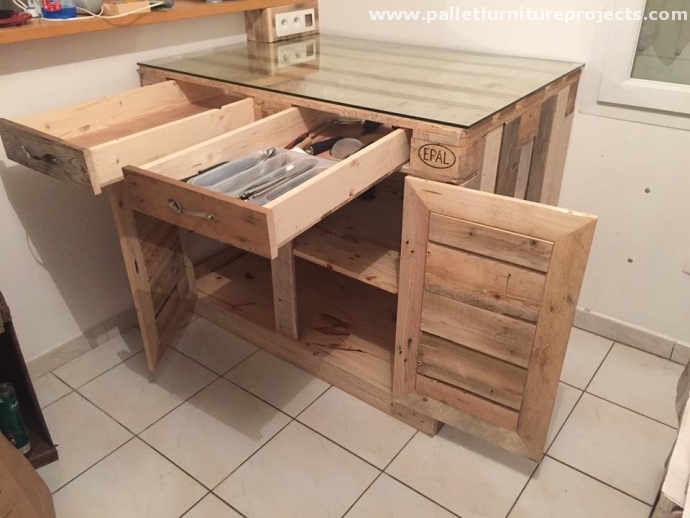 Ok, here is a deal for those who say that I am not happy with mere pallet wood recycled kitchen accessory, I need some touch of like marble or something like that. 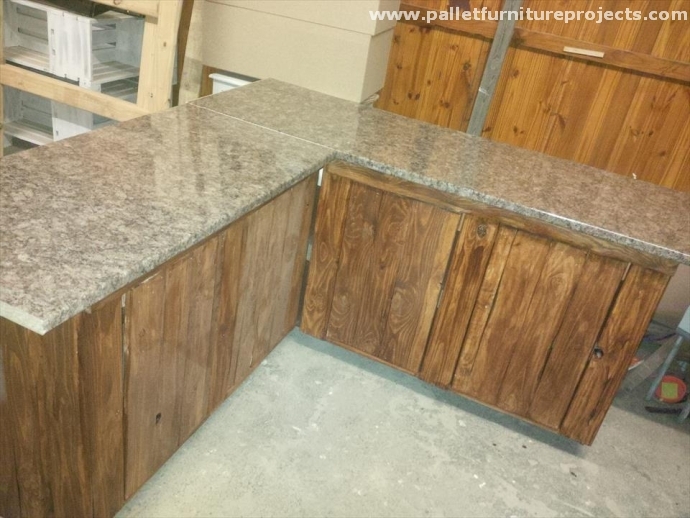 So just be cautious to have a look on this wooden pallet cabinet with the marble top. 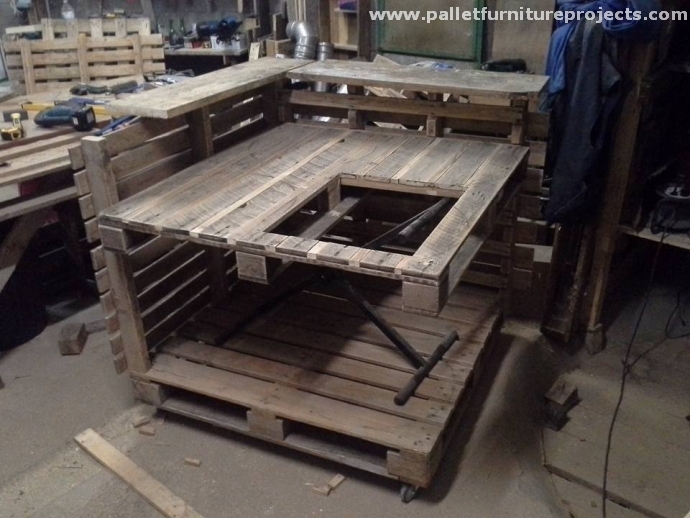 Now this is simple wooden pallet recycled cabinet, we designed it in such a manner that maximum storage space could be created. 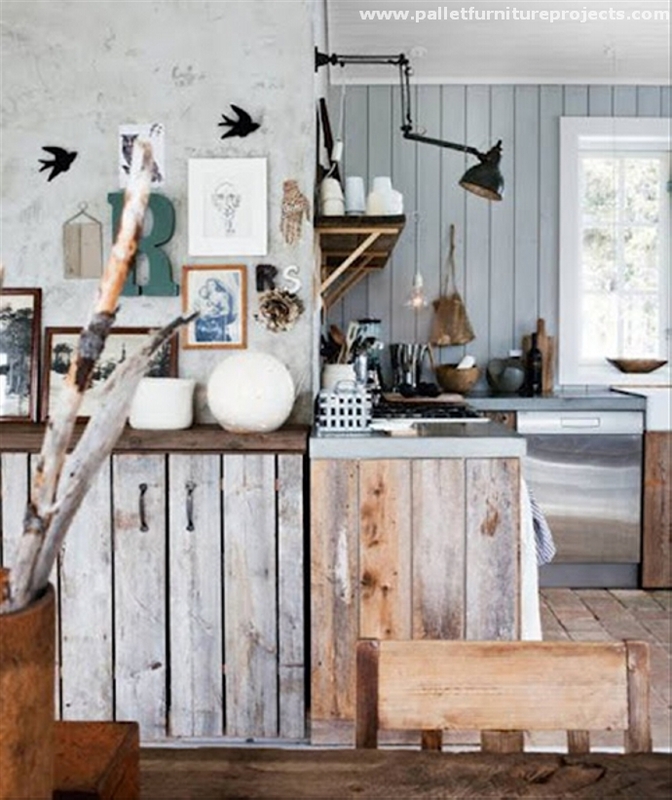 Its rustic appearance would be an incentive for you, while the ample storage space offered by it is going to take care of all of your kitchen accessories. 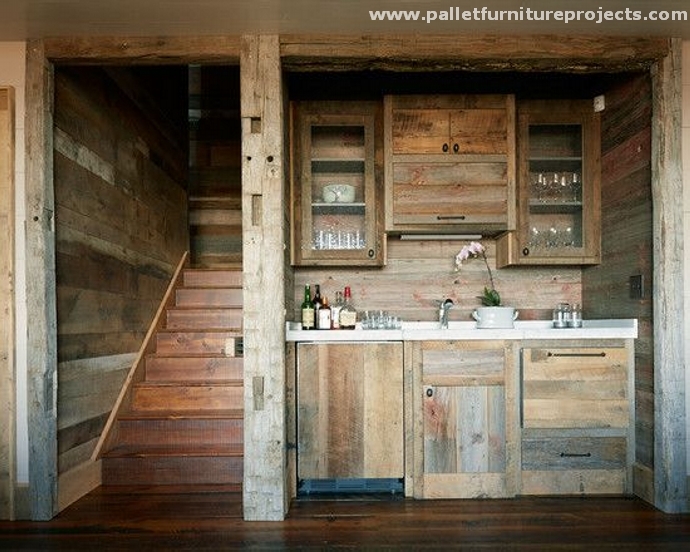 If you still want to go even farther, you can manipulate the pallet wood planks by painting them in an attractive manner. 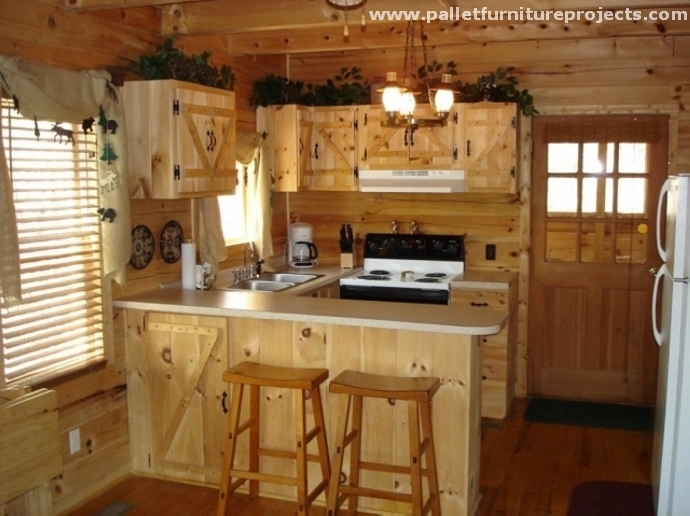 Like in this kitchen cabinet, we have painted each pallet wood plank differently to create a beautiful pattern. 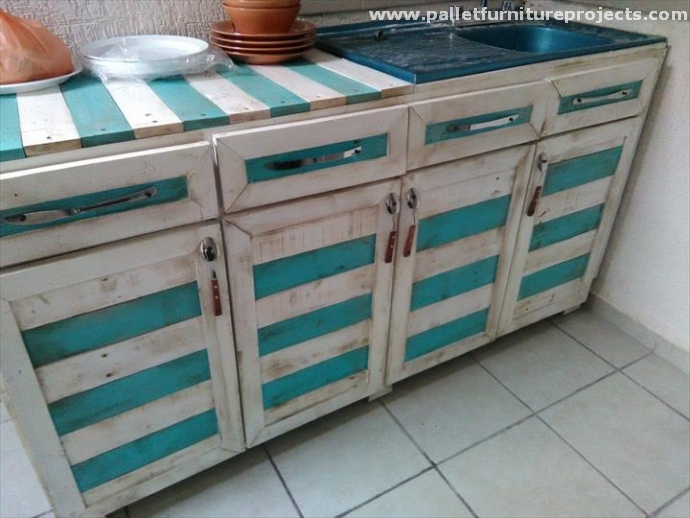 Despite of the roughest pallets used in this kitchen cabinet, it still makes a beautiful kitchen installation. 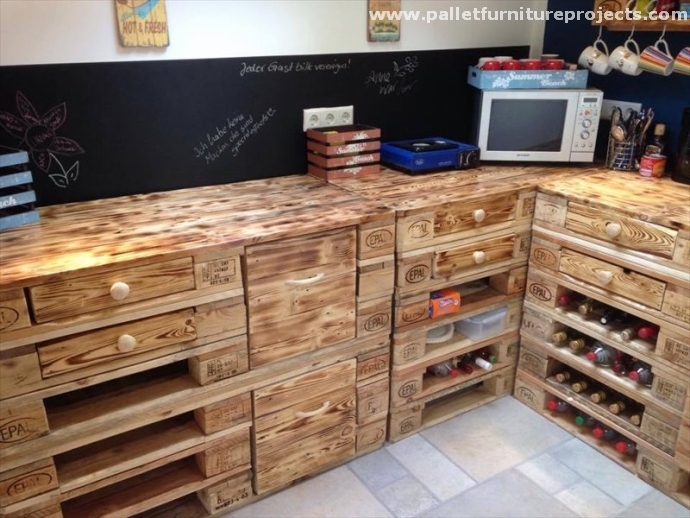 Now if this comes to the general kitchen furniture, you can again resort to the shipping pallets. 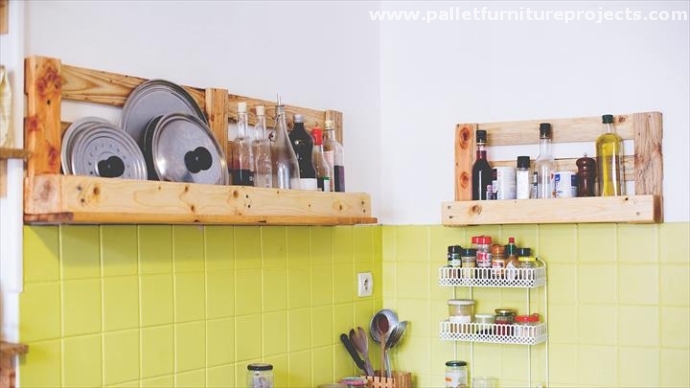 And you just don’t need to worry about the condition of the shipping pallets, no matter how broken and deteriorated they are, they would still do a perfect job for your kitchen installations. 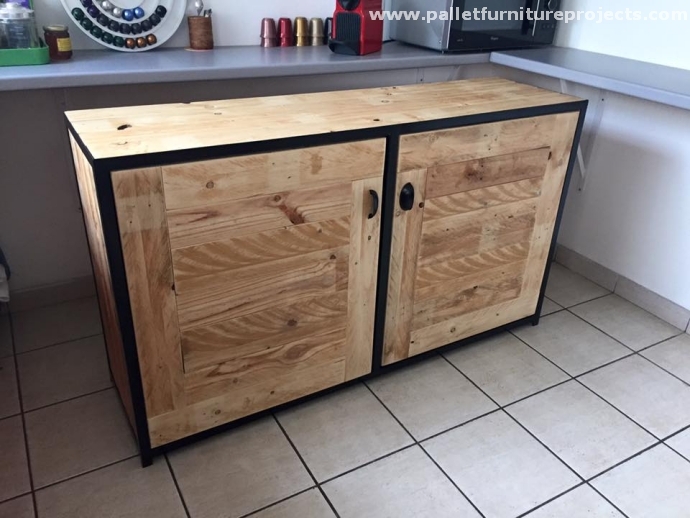 This time this is something a bit too much for your kitchen, this huge and elegant wooden pallet recycled kitchen island would be perfect companion for the house wives while working in kitchen. You can design, shape and equip it with all the desired features that you consider should be there. 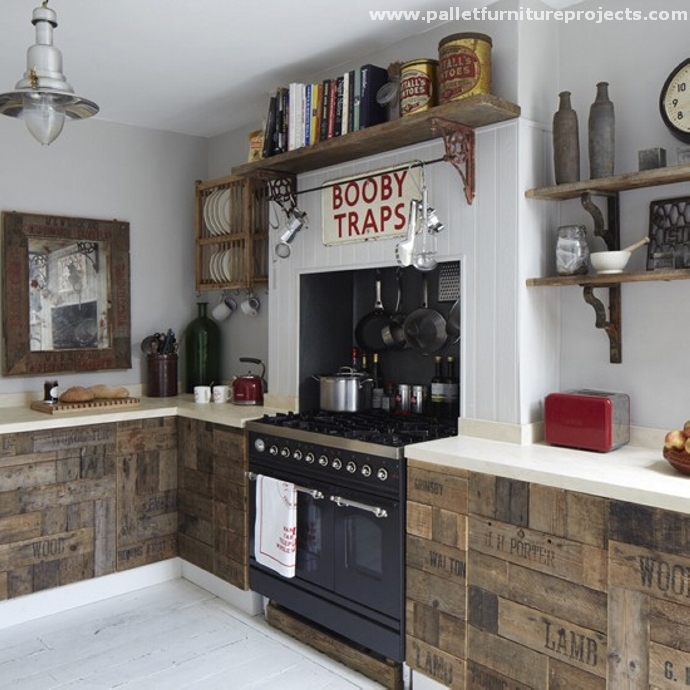 On the end here is a simple and handy wooden pallet project for the kitchen. 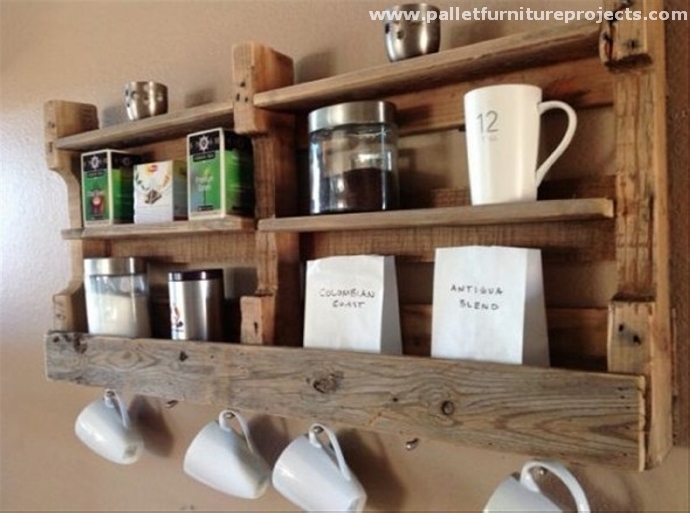 Provided with ample storage space and hooks on the base, this makes a perfect kitchen wall shelf where you can place a lot of accessories and hang your coffee mugs.